I chose to ‘donate my status’ and track the use of new media in this historic election, but as usual, did it the maverick vs. sheeple way to ‘see what would happen’ if I could support a proposition vs. a person! Not so fast, whippersnappers! (insert granny grin of your choice) Much has been made of the youth and internet’s role in the making of the Tech President, but to me, media is STILL just the distribution channel…Mass media has little to do with whether or not you’re informed about the issues themselves. It’s easy to mass market. It’s more difficult to impart meaningful core messages en masse! 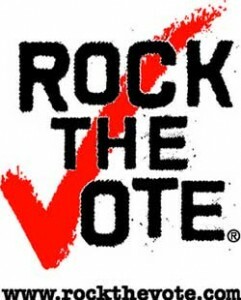 I’d like to look deeper into how political activism and new media have mashed up in new ways to “Tweet the Vote” and ‘Reboot America’ but moreover, how the conversational dialog has enhanced and/or diminished the formation of opinions. What can we learn from the media mobilization of constituencies from all sides? How are youth engaging in various media? Are Web 2.0 dialogs like the running commentary on Current TV’s ‘hack the debate’ a social experiment that will stick? Is there a concern we’re entering into even more of a distracted “sound bite” mentality with microblogging when what is needed is more substance? Or are the URL links data nuggets to contribute value and depth toward a more meaningful conversational probe? Example? Somehow the ‘hack the debate’ concept was neat in theory, but the multitasking notion of trying to comment, read comments, watch and listen in real time seems to alter the entire conversation into a distraction…Kind of like being in a virtual world in full role play when someone is “instant messaging” you out of character. Many gamers admit how DIFFICULT it is to be in two ‘worlds’ at once…(real/virtual/IM/online) so the thought of multiple conversations with a cacophony of noisy distractions resulting in “those who don’t actually listen or don’t allow themselves time to process what they’re hearing.” (hack the debate commenter) seems a bit ADHD on the focus-front, ya know? With real life issues and substantive voter content in the mix it seems less than desirable for retention…but you’ve got to hand it to Current TV for trying…it was an unfiltered experiment worth giving a go. But then…we may not even be talking about YOUTH in the microblogging sphere. Which begs the question, are social networking platforms and political activism just another way to communicate with an already engaged public? Or are we pulling in new eyes and ears into the civic arena? 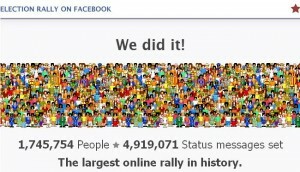 How much of the Facebook rally was youth? If MySpace has been taken over by 8th graders, and Facebook is attracting more adults, brands, and mainstream use, then where are the youth landing in the media mix? Then at midnight, (12:01am to be exact) like Cinderella, everyone’s status line turned into a cause (those that had chosen to participate) and lo and behold, the fairy godmother of voting wishes sprinkled some pretty substantial stats for election day reminders! 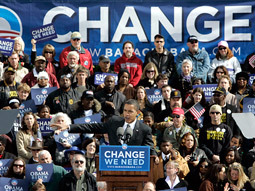 As cool as the Facebook rally was, and the plethora of media hype swirling the blogosphere that ‘young people rocked the polls’ and ‘Obama won the youth vote’ I strongly feel the ageless inclusiveness and bipartisan cooperation that Mr. Obama tapped into is being overlooked for the ‘shiny penny’ of media and millennial magic. If I were Senator Obama, I’d be a wee bit irked if media portrays him as winning based on a pile of texts, tweets, and turnovers of status to implore campus kids to get their keisters out to vote…it belittles his platform. To me, giving too much clout to any one demographic group or media channel seems a bit risks falling into the ‘causal link’ approach that flies in the face of critical thinking skills when sweeping generalizations trump reality. …But that doesn’t factor in the multi-generational ‘me to we’ zeitgeist where people of multiple ages, colors, and socioeconomic backgrounds were voting on the “change” platform of “brand Obama,” converted Republicans and Colin Powell’s of the world united in purpose. To me, the massive mindshift from “me to we” is lighting up some hope and promise in a very messy world right now…”We’ll be the ones in control of the economy,” this young voter implored, so it’s easy to see why the very act of voting is an act of hope. That’s a snapshot, not a photo album. 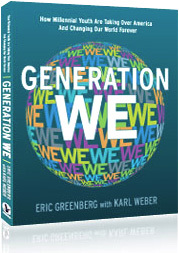 So why did I find myself squirming a bit when I watched this “Generation We” video, (below?) I figured I’d lap it right up in ‘power of media for positive change’ mode, and instead I felt a little…well…edgy. Maybe even uncomfy. Was it because I’m not “born between 1978 and 2000” and a card-carrying member of Generation We? 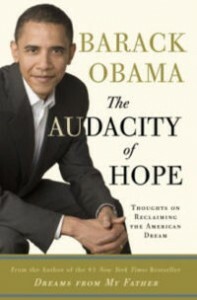 Obama is talking progress, bipartisan hope, and unity, and the WE video is using the ‘same ol’ same ol'” requisite dose of anger, angst and rhetoric of “who made the mess, and who has to clean it up” bit. So I guess I’m ready for some ‘we’ thinking…some ‘we’ action and some ‘we’ pragmatics to mop up the massive mess. This is supposed to be the dawn of a new era with new thinking and new solutions…so let’s stay with the inclusive tone of hope and promise…Do we really want to widen the generation gap now that we’ve narrowed the racial one? A chasm is a chasm, and I’m not eager to swap one for another. Build up, don’t tear down. Turn “me into we” without shouting. Can “WE?” Yes, we can. Generation WE video (Gen-we.org) What do you think? A very gracious twenty-something band of voices, filled with hope and promise in “can-do” spirit! Warms my heart. And of course, the ‘mom’ in me is thinking, “what manners! To Thank your supporters, grow your friendship base with kindness and show the world what matters to you.” Millennials rising indeed. 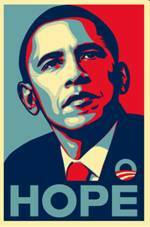 “No matter your political persuasion, November 4th was a historic day. This is particularly true for young people. We at Causes are all in our twenties, and we are very proud that our generation overcame many doubters and turned out to vote in unprecedented numbers. But our generation did not just vote, we built innovative tools that changed how the election was conducted, and the Election Rally was just one of many successful initiatives. Our goal was to make sure as many people in our generation voted as possible. We did not think it would be enough just to remind people, you would have had to have been living in a cave to not know it was election day. We wanted to use the unique social nature of Facebook to create peer pressure to let everyone know that all of their friends wanted them to vote. To this end, the focus of the initiative was the “Midnight Rally,” which people could sign up for starting the evening of October 30th. 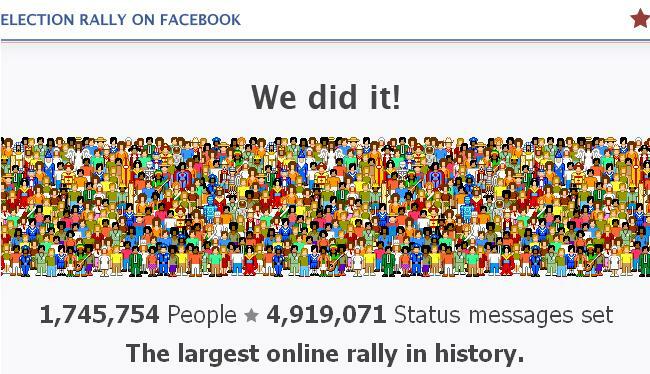 Just after midnight the night before the election, 932,846 people’s status messages all changed at the same time. This rippled across Facebook and Feed, leading millions of the friends of the participants to wake up the morning of election day with multiple friends reminding them to go vote. This was perhaps the largest simultaneous action in internet history. We can never know its true effect, but we like to think it made a significant difference. 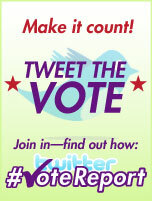 I think we’ll be studying the role of social media tools in political campaigns for quite awhile. I’d like to see more data supporting what we’ve seen, to prove or disprove our suspicions regarding youth & media. But, what really excites me today, is what happens next. How does the ability to build a massive online database of supporters impact how you go forward in shaping policy? 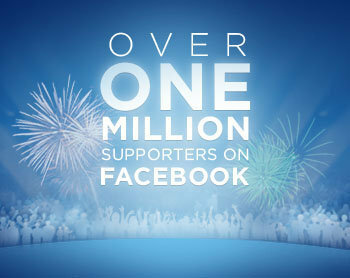 How do you continue to engage those supporters in a positive, mutually beneficial way?